Here’s the IBM InfoPrint 75 specifications and information for download and sharing. Find out details for comparisons. Quantity discounts available. Get quick quotes. Supports common printer data languages PostScript and PCL. The IBM InfoPrint 75 are continuous feed laser printers that provide the document sequence integrity of continuous forms printing in a compact footprint backed by around-the-clock service. For documents that must remain in page sequence, the InfoPrint 75 prints invoices, picking slips, labels or mailings with the high throughput of a continuous forms printer. Print output is at 600 DPI, providing superb clarity on text, graphics and sharply defined barcodes. The InfoPrint 75 is backed by InfoPrint Availability Services that can be tailored to your operating requirements. 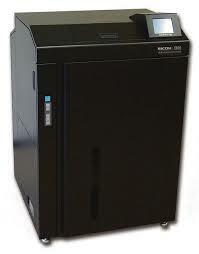 These printers are Energy Star Compliant and support an energy-efficient operation. The InfoPrint 75 is an entry-level continuous forms printer. It features ease of loading for box fanfold forms and easy unloading from a power stacker. The highly reliable tractor feed paper path can print forms formatted in 1-up landscape format or 2-up portrait format with a simple adjustment in the paper path.